How many luxury brands will disappear from the market by 2018? Everyone is anticipating brand consolidation in the car market. When I look around there are new small brands popping up like mushrooms all the time. A number of established brands will certainly not have an easy time of it in future. You really don't have to worry about Porsche. We are one of the very few manufacturers that can combine a high degree of exclusivity with commercial success. 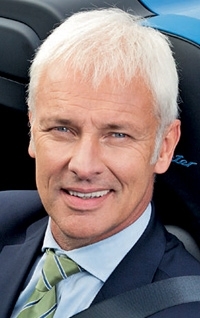 By 2018, Porsche CEO Matthias Mueller, 57, aims to boost annual global sales to more than 200,000 units, up from 97,000 in 2010. To do so, he will introduce at least one new Porsche every year. Mueller, a former executive at Volkswagen AG, replaced Michael Macht as Porsche AG CEO in October. From 2003 to 2007, Mueller led VW subsidiary Audi's product development, then coordinated VW Group's overall product strategy. Mueller spelled out Porsche's challenges in an interview with Harald Hamprecht, editor-in-chief of Automotive News Europe. Q: What is your vision for Porsche in 2018? A: Porsche is synonymous with sports cars -- yesterday, today and tomorrow. In addition, in every other segment where we operate, such as with the Cayenne or Panamera, we always offer the sportiest vehicle. At the moment we are hard at work on our future strategy. And, I promise you, it will contain a few exciting surprises. What are your most important objectives? We want to remain the world's most profitable car manufacturer and build on this position. We are going to raise the bar even higher in terms of customer satisfaction, employee satisfaction and product quality. What are the greatest challenges facing your product strategy? We will improve coordination between our model line product life cycles. Each year we want to celebrate a major event, namely bring a new Porsche to market. We are also revising and improving existing products and looking to see what would bolster Porsche's image in terms of healthy growth. Can you reach the sales goal set by VW Group boss Martin Winterkorn of 150,000 units by 2015? I think that if we do everything right we could even achieve that a bit earlier. Our objective is to have more than 200,000 units a year by 2018. What are your goals for the next-generation 911 that you will bring to market this fall? The new 911 will be the most successful of all time. Averaged over the life cycle, we want to sell 30,000 units a year. By way of comparison, in 2010 it was 20,000 -- at the end of the life cycle. What are you going to introduce in 2012? We will have the 911 Carrera in 2012 in its first full year of production. After this market introduction, we will also launch the entry-level models of the Boxster and the Cayman. What new variants will there be in terms of body and drivetrain? With the 911, we are up to 22 derivatives. We use this as an example for the other models. What derivatives can we expect from the Panamera? 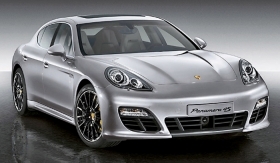 The Panamera has been on the market now for one and a half years. The product life cycle is typically about seven years. To mark the halfway point, we have planned a product upgrade. The car will be given an even more sporty look. I can imagine a long-wheelbase version, especially for growing markets such as China and Russia. We also think that a plug-in hybrid concept would fit well with the Panamera. And there are many more ideas out there, like a two-door Panamera that makes even more of a coupelike impression, and so on. We're keeping all our options open. Currently, things are going so well with the Panamera that we're not in any hurry. For 2014, I could imagine a legitimate successor to the Porsche 550 -- namely, a small midengine sports car. Actually, I couldn't imagine a better name for a small roadster like that than the 550. But we're just in the assessment phase. And Porsche has taken on responsibility within the VW Group for developing the Mimo -- namely, the midengine entry-level roadster? Yes, we will develop the Cayman-Boxster line as the basis for other future sports cars. What competitors do you see in that segment? To be honest, very few. In another price bracket, there are models around such as the Mazda MX-5 with a segment share of just under 50 percent. We think that there is still a lot of room for Porsche and one VW sister model. When will we see a supercar positioned above the 911 -- the so-called Porsche 929? Theoretically, there is indeed still some space there. A 911 GT2 RS costs about 220,000 euros [$296,960]. The 918 Spyder will be significantly more than that. Between the two there is still a gap where Italian competitors are currently very active. We are investigating that as an in-house project. We will make a decision by the middle of the year. When might you produce vehicles in China and the United States? In the long term, the VW Group plans to sell between 10 million and 11 million cars a year. Production capacities are currently at 7 million to 8 million. To meet the required capacity in the VW Group, we certainly have to build five to six new plants worldwide. We should signal our own requirements in good time. How will Porsche coordinate its product-development activities within the larger VW Group -- especially with regard to Audi and Lamborghini? We have taken over responsibility for developing the future sports car module. In addition, we are responsible for sporty sedans with rear- and all-wheel drive. And there are two other groupwide fields that we take care of: lightweight construction and engine expertise. In an era of global warming, how do you intend to safeguard social acceptance of your products? We are planning a hybrid concept in each model line. As already mentioned, we're thinking about a plug-in hybrid variant of the Panamera. That would be the first of its kind in its premium sedan segment. With the 911, sportiness remains center stage. Thus we are planning a mild-hybrid variant [an automatic start-stop function] here at first. When will we see a "pure" electric Porsche? Should it become apparent by 2020 that 20 percent of all new cars will already be electrically driven, then you can take it that Porsche will also be challenging for 20 percent of its sales with electric vehicles. But I'm betting on a total EV share closer to 3 percent to 5 percent by 2020. We are now almost over the initial hype before the business really gets started. What is Porsche's global sales target in 2011? The minimum target we have set ourselves for 2011 is to beat the previous year's performance of 97,000 sales. We want to reach the 100,000-vehicle mark. What are your greatest short-term challenges? We are bringing the next generation of the 911 to market in autumn 2011. In the meantime, we will get the phasing out of the current generation exactly right. In parallel with that, we are working on the technical concept of the 918 Spyder and Cajun. Will the 911 be a sales leader? No, that's not achievable because the segment is simply not as big as an SUV or sedan segment. What is far more important to us is that we remain the market and segment leader. Last year, the United States was your largest single market, followed by China and Germany. Will China overtake the United States as your largest market? I am assuming that our ranking will change. It is likely that in the short term China will become our largest market worldwide, thereby supplanting the United States. But the United States will remain one of our most important markets, which we are doing a great deal to cultivate.